This is an artists way of pointing out where the electrical outlets and electrical panel show be positioned. Thankfully, our electrician was able to read out 'blue prints' and do a great job. The origin of this collective is based on our two founder's need to create conceptual work, and develop a mastery of glass blowing. The world of art is very nuanced when it comes to making money through art, where ideas are cultivated independent of market viability. Some concepts need to be expressed to create dialogue with an audience, and the result might not be[ financial security. 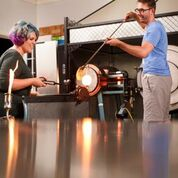 The Glass House is taking the same steps as many artists and crafts people before us where we are sharing the whole experience of the artist's process of glass blowing. This endeavor is a challenge because we are making ourselves and some types of work we make a 'product' in order to make a living, the trade up is when we make work based on concepts that look for a dialogue with an audience - that audience might ignore us. This is the age old dilemma in art, does one make what they believe is important and risk many years living an unstable life, or make market ready products and gain some financial stability, risking lost credibility when we make conceptual work.